Eastern’s Cera Grueser gets a hit off of Southern’s Sydney Cleland (right), during the Lady Eagles’ 8-2 win on Thursday in Tuppers Plains, Ohio. TUPPERS PLAINS — Stingy in the middle innings. 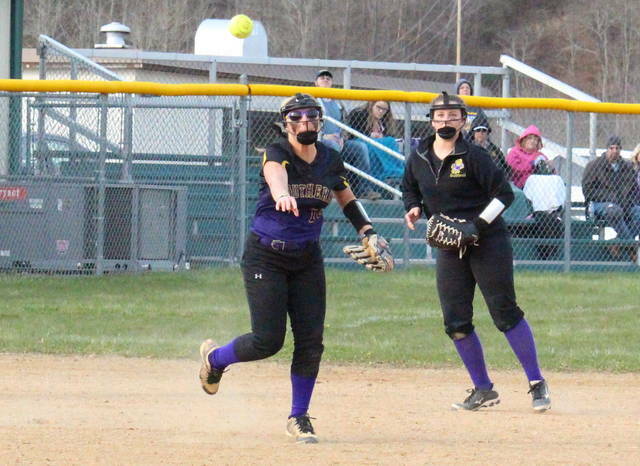 The Eastern softball team allowed Tri-Valley Conference Hocking Division guest Southern to reach base just three times in innings 2-through-6, as the Lady Eagles claimed an 8-2 victory on Thursday evening in Meigs County. 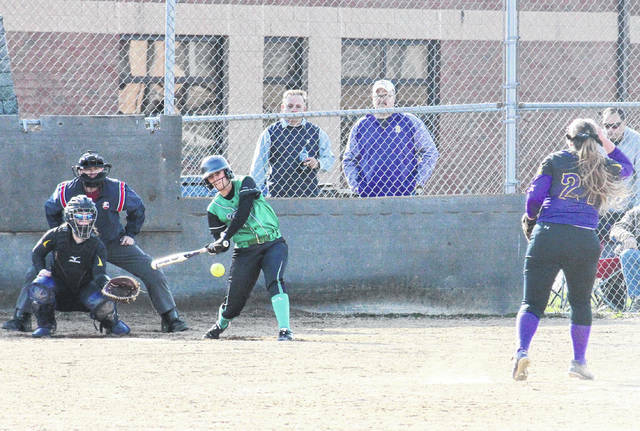 The Lady Tornadoes (0-2, 0-1 TVC Hocking) got on the board in the top of the first inning, as courtesy runner Cierra Whitesell came home on a two-out error. After a walk and an error to start the bottom of the first, Eastern (2-1, 2-1) tied the game at one, when Sidney Cook drove in Sydney Sanders. With two outs in the inning, Courtney Fitzgerald singled home Cera Grueser to give the Lady Eagles a 2-1 advantage. Still in the first inning, a Lady Tornadoes error brought home Fitzgerald and Tessa Rockhold, then a Kelsey Roberts single brought home Ally Barber. The Lady Eagles made it a 6-1 game in the bottom of the second when Cook doubled home Grueser. Eastern’s lead grew to 7-1 in the bottom of the fourth when Cook singled in Sanders, and then the Lady Eagles went up 8-1 in the fifth when Barber singled in Fitzgerald. Southern’s Jordan Hardwick scored on a passed ball in the top of the seventh, but back-to-back strikeouts gave Eastern the 8-2 win. Tessa Rockhold earned the pitching victory for the Lady Eagles, striking out six batters and allowing two unearned runs on three hits and one walk in a complete game. 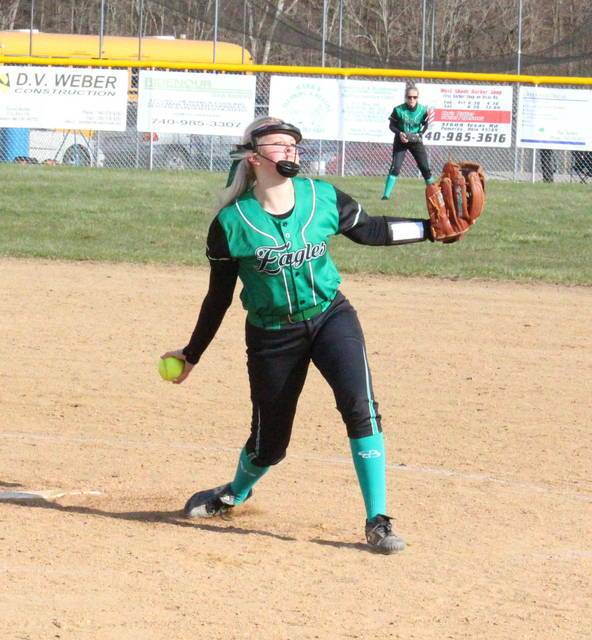 Sydney Cleland suffered the setback in a complete game for the Lady Tornadoes, striking out three and walking one, while allowing eight runs, two earned, on 10 hits. Leading the Lady Eagle offense, Roberts was 2-for-3 with a run batted in, Cook was 2-for-4 with a double and three RBIs, and Grueser was 2-for-4 with two runs scored. Fitzgerald singled once, scored twice and drove in one run, while Barber singled once, scored once, drove in a run and stole a base. 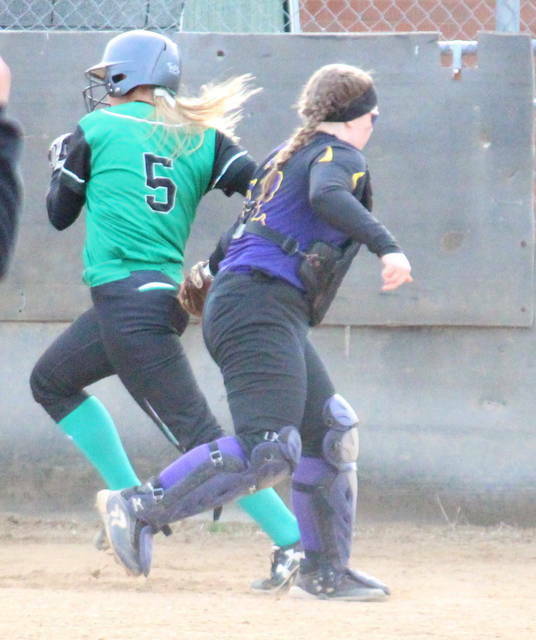 Tessa Rockhold and Emmalea Durst both singled once, with Rockhold scoring a run. Cleland, Shelbi Dailey and Kaitlyn DeLaCruz each had a single for the Lady Tornadoes, while Whitesell and Hardwick both scored a run. Both teams left four runners on base. Southern committed four errors, while Eastern had three. The rematch between the Lady Eagles and Lady Tornadoes is set for April 23 in Racine. After a trip to Federal Hocking on Saturday, Eastern will be back home for a meeting with Wahama on Tuesday. Following a home game with Miller on Friday, Southern is scheduled to visit Trimble on Monday.